I took this pic this morning, walking to the train station. I love cobwebs. I know that sounds weird. 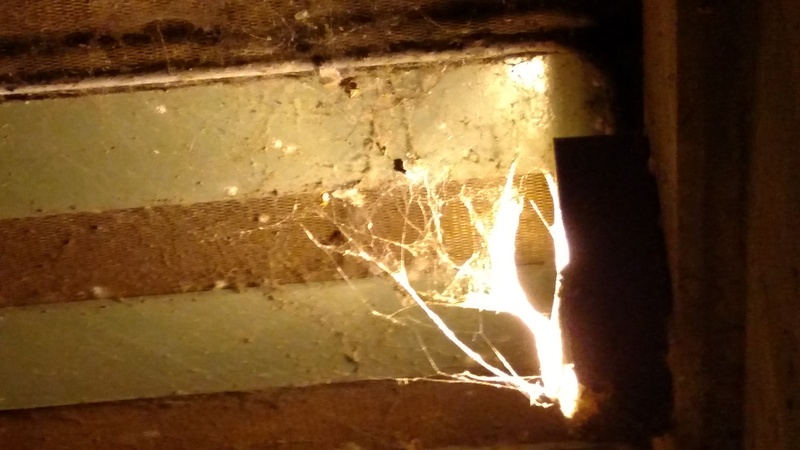 Most people think cobwebs are dirty and mean spiders are around, but a cobweb is actually an abandoned web. Yes, they’re technically dirty since dust and crap stick to them, but there won’t be any spiders. The spider who built the web has either moved on because it was catching no food, or died. It’s that last part I love. Not that I dislike spiders – just the opposite. Spiders eat the bad bugs, so they’re OK in my book. No, it’s the transition part. Every cobweb is a tiny reality of change. People say change is inevitable, but most of us don’t embody that. That’s a comfort thing, I suppose. It can also be a fear thing, though. The fear of trying something new. The fear of leaving what you know, even if that’s not working for you anymore. If you’re in a place of comfort, great. Stick around. Hang on. If you’re not, be like the spider who isn’t catching any food and move on to a new spot and build an even better web. DON’T be the spider who hangs around until it starves.